Summer is here and Fall is approaching which means more and more households will be firing up their grills! Grilling is one of the most popular ways to cook food, but it’s important to keep safety in mind as a grill placed too close to anything that can burn is a fire hazard. Here are a few grilling safety tips and reminders to keep in mind provided by NFPA. • There are several ways to get the charcoal ready to use. Charcoal chimney starters allow you to start the charcoal using newspaper as a fuel. • If you use a starter fluid, use only charcoal starter fluid. Never add charcoal fluid or any other flammable liquids to the fire. • There area also electric charcoal starters, which do not use fire. Be sure to use an extension cord for outdoor use. • Check the gas tank hose for leaks before using it for the first time each year. Apply a light soap and water solution to the hose. A propane leak will release bubbles. If your grill has a gas leak, by smell or the soapy bubble test, and there is no flame, turn off the gas tank and grill. If the leak stops, get the grill serviced by a professional before using it again. If the leak does not stop, call the fire department. 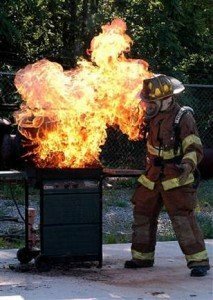 • In 2003-2006, U.S. Fire Departments responded to an average of 7,900 home fires involving grills, hibachis or barbecues per year, including an average of 2,900 structure fires and 5,000 outside fires. • Although gas grills are used roughly 1.5 times as often as charcoal grills, they were involved in five times as many fires. • One-third of the home structure fires involving grills started on an exterior balcony or unenclosed porch, 18% started on a courtyard, terrace or patio, and 11% started on an exterior wall surface. • Flammable or combustible gas or liquid was the item first ignited in half of home outdoor grill fires. In 51% of the home outdoor fires in which grills were involved, 56% of the outside gas grills, and 29% of the non-confined gas grill structure fires, the fire started when a flammable or combustible gas or liquid caught fire.